Yesterday during my nursing lunch break, I went out to the Playhouse to read this week's challenge themes aloud to Hammy as he chased his tail. It's a thing we do. That's his way of thinking, remembering, connecting the dots, lining up the ones that jive with each other, eggsetra. When I got to the Christmas challenges and told him that Merry Monday's challenge was to use a moose, he squealed and did a somersault halt. When Hammy squealed, that made me squeal, too, even though I didn't know why. It's funny how reactive we are, isn't it? Then we both looked at each other, startled by our squealing. Hammy quickly reminded me that we have had an orphan moose die-cut in our Bits Box since the last century. Well, hello! That made me squeal for reals. I grabbed some pretty linen paper in both white and embossed cream. I cut the snowbank with a Paper Smooches "Borders" die. The adorable bit of moose ribbon that I've been dying to use is also ages old. The sediment, however, is NBUS! It is from Stamping All Day. The hooveprint shadows were hand-drawn. The rusted jingle bells and gold threaded twine made for a festive collar for the big guy. 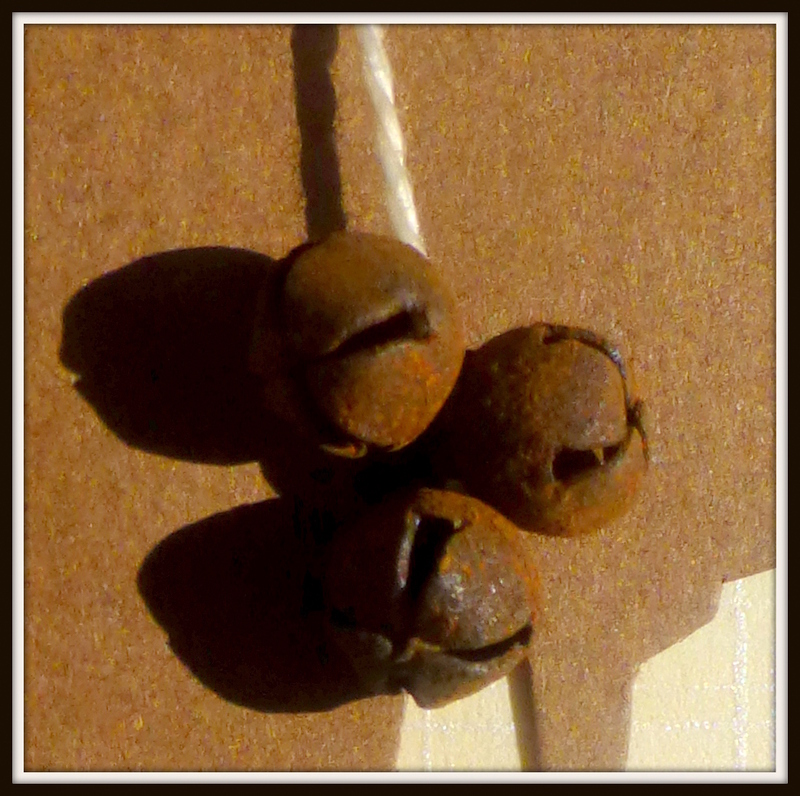 I bought them rusted like that. Seriously. I'm lazy like that. I'm trying to picture how the conversation went between the store owner and the jingle-bell maker when the owner told him she would buy several hundred packages of jingle bells, but only if the manufacturer first left them out in the rain to get rusty before packaging them. It makes me giggle to think of it, but, I mean, c'mon, you have to admit they're perfect for the moose bling so the gal knew what she was doing! Merry Monday Christmas Challenge: The Moose is Loose. That was fun! I used my KGT paints. 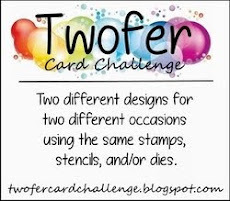 I'm entering this card in Simon Says Stamp Monday Challenge: Wonderful Watercolor. Here are five more talented new friends for you to get to know! Diane Marsh of Keep For Ever Cards. Diane has been blogging now and then since 2009. When life doesn't get in the way ~ which it occasionally does for all of us ~ Diane shares her beautiful cards lovingly made for family and friends. Diane will also inspire you with her conscientious use of her scraps! 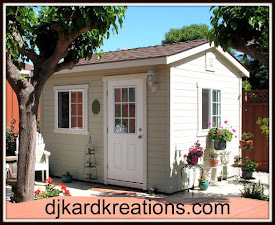 Jan Clothier of Scrapbooking Stuff. Jan is from New Zealand and she has been blogging since March of 2013. She has been scrapbooking for about six years and making cards for a little over a year. Like so many of us, Jan enjoys entering challenges. 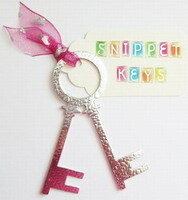 She has won many awards for her CAS cards which show her magnificent attention to detail. Majo Wybranietz of Majo's Art. Majo has been blogging since 2010. She is a designer whose work has been oft-published and she is well-recognized for her challenge wins. Majo also shares with her readers tips and photo tutorials on new techniques. You will be inspired by Majo's talented card designs and altered art creations! Janice Stone of Jan's Journey. Jan is brand new, having just started her blog in May! She is so thrilled to be on this wonderful new blogging journey and her enthusiasm is very contagious! I know it would mean the absolute world to her if you stopped in to say hi and introduce yourself. And while you are there, you can admire her fabulous cards! Carole Burrage of Mother's Little Helper (TruCarMa on Splitcoast Stampers). Carole started blogging in - wow - 2007! She is one of the founders of our little community in Blogland and you better believe you will find a ton of inspiration at her place! And I don't just mean card inspiration. Once you read Carole's "About Me," you will be inspired by how she manages to juggle all the life balls that have landed in her basket! The kids and kidlets are coming over for lunch today, so we're looking forward to that as we are now in the sixth slow and boring week of recovery! A wonderful twofer Darnell ! 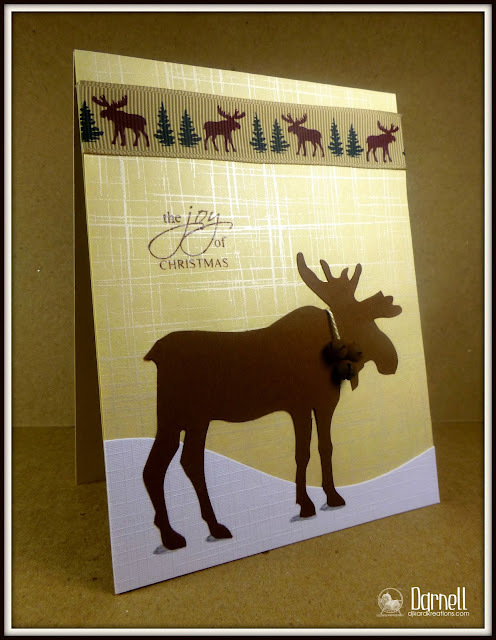 Love your moose card with the rusty bells and the fab ribbon across the top! Hi Darnell, I thinks those bells are fitting perfect! Love the ribbon. Thanks for joining us at Colour me! Darnell, you and Hammy have just made the most perfect Christmas card for my daughter... Her nickname is "Moose" (no, she's not all that big and hairy... it's a long story!) so anything with a moose on it is perfect, as far as she's concerned. Of course, it would have to be THE most difficult animal to get hold of here in the UK! And your other card is such a beautiful, happy card. The perfect thing to see on such a dull and dreary morning! Hi Darnell, Loving both cards. I have the embossing folder for the second one. I gotta get me a hammy ... Gingercat often joins me but the only challenge is to get me off the chair and him on it! Super Duper cards my friend ... Yep, funny about those bells ... never really thought abut it till you said... Have a great weekend ... hope the Mister is feeling better! I especially like your watercolor card today -- the rainbow colors are happy without overpowering the design. Thanks so much for your nice comments on my blog. I can't believe that you took the time to comment on everyone's NBUS entries -- there were so many! Love stopping by here, and I enjoy hearing about your day as much as I enjoy looking at your cards! These are gorgeous! LOVING that moose!!!!!!!!!!!! Now that's a real man's moose, Darnell. Oh so handsome. Love his bell collar and most of all how you gave me a good laugh this morning telling me about how he came to be. Have a great weekend! Wonderful Christmoose card. How fortunate you still had that ribbon to go with the cute card. Love that watercolor card too. Wonderful moose card, especially with his rusted jingle bells...and those hoof prints are genius! Love the thank you card to Kylie. You really captured the logo with your KGT paints...and can I just say thanks for using the initials! I am going to start using them now too! Hope you have a wonderful lunch with the family! Hugs and kisses sent your way! Ahh, nothing like a little bit of rust to bring out the moose. ;) :) Love both your cards today. And who doesn't love rust just for it being rust?! I've not stumbled across any rusted jingles or I'd have a some in my stash. Lucky you! Have a wonderful time with grandkids. Hugs to you and a handshake for Mr.
Two great cards, Darnell! Love your Christ-moose, rusty bells and all, the watercoloring on card #2 is beautiful. Regards to Hammy and the Mr! It was like that moose card was meant to be! Yay for using decade-old supplies that patiently waited in the box all this time! Those jingle bells are wonderful! I love your rainbow of color and that swoopy cut on your beautiful thank you card! Hammy sounds like quite the character. Both cards are great! I love the rustic bells you added to the moose. Awesome Moose card Darnell, love every detail! Thanks for sharing at Merry Monday. Happy Weekend! What a fabulous moose card .... I love him, and his rusty bells are just perfect! Two gorgeous cards! I can't believe how perfect that ribbon is on your moose card! What a great masculine card. Love the rusted bells. This moose is very impressive and the gingle are perfect for his age lol. Love the snowbank and the matching ribbon! Your second card is stunning and is my favourite for today. Love soooo much the rainbow colours on the top and the sweet embossing! Wonderful CAS!!! Beautiful cards! Darnell, I think those rusted jingle bells are perfect for that handsome moose. I love the watercolor dripping on the second card - gorgeous! Your moose looks fantastic with those rusty bells (they are perfect for a rustic look) and I love the linen paper! And that watercolored card is swoon worthy! Oh, here I am reading your blog, chuckling again! Loving your Christmas moose, he's fabulous. Such a gentlemanly card, love the textured surfaces and those rusty bells. And I'm loving your recreation of the HLS logo, fabulous job. Darnell, the second card is stunningly beautiful. I love the colors and the way you used embossing folder. Until now, I had no idea at him, your shot is brilliant. The first card I was enchanted by these wonderful old bells. An amazing idea. Awesome cards. I like the moose one a lot. Sorry been awol for a while. When I saw mention of moose, I started dribbling and imagining some lightly whipped chocolate creation.......then realised it was moose not mousse. Love both creations especially the splash of colour on the second as its been a particularly dull day here today. Hope hubby is doing better. your moose is really fab, and that ribbon is perfect to gowith it. Love the rusty bells too. Your second card is also very super too, and a very fab design also. Hope the mister is well on the mend now. Love that big ole' moose card with the perfect moose ribbon. Very pretty watercolor card also. There's a Moose, loose, about this hoose, a song from way back when, suddenly came to mind, who's have a mind like mine. Fabulous card and I also love your second one, fabulous embossing image and love the rainbow colours. You moose is most definitely NOT loose, especially with those rusty balls... er...jingle bells around his neck. He's very festive looking and aren't you lucky to have ribbon to match. The twofer is really pretty. Great embossing and love the drippy watercolor. Simply gorgeous. Was wondering what you've been doing besides being the best nurse possible. Now I know. Think of you often and hope you and the Mister are progressing in a positive way. I love your super moose card,not an image we see very often here in UK. Lovely linen effect card and gorgeous ribbon as well, and the rusty bells are the perfect embellishment. You have put that awesome moose with the rusty jingle bells on the perfect paper, Darnell! Imaging having the perfect ribbon too! Did Nina consult you before calling this challenge? 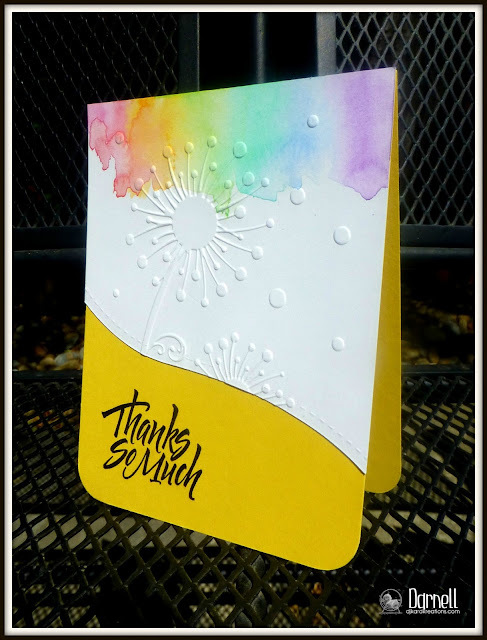 Love your drippy watercolor with the dandelion embossing! Bright and cheerful. Enjoy the kids and hope Kevin is feeling better each day. Love your moose card Darnell, so happy he's not an orphan any more! Love the border too! Wonderful cards, Darnell! I love that moose. I cannot imagine why anyone would want unrusted jingle bells. Rusted ones have so much character! Love your moose! Such fun! Well, I don't have a colleague like Hammy to help me, but he sure does prompt you in the right direction, reminding you of forgotten die cuts and such! So glad you found the moose - and those bells are perfect! I also love your take on the HLS logo - you nailed it! Thanks so much for your entertaining blog posts and your wonderfully creative cards. Hope the nursing is not too strenuous and your man is improving as he expects to. Keep up the good nursing ... I am sure the Mister appreciated it. Two beautiful cards! I was drawn by the moosecard that I saw at LIM... Great image and the handdraw shadows are perfect! No wonder Hammy squealed when he remembered the moose - it's perfect and looks like the ribbon was made specifically for him.......brilliant. Love your card to Kylie and I know she will as well. Great effect you've got with the watercolours - stunning. Hope you are enjoying a wonderful weekend. Those rusted jingle bells worked out perfectly for your moose card!!! Both cards are fabulous. The moose ribbon and the bells are wonderful embellies for your moose card. Love the watercoloring and embossing combo. Such wonderful eye candy today Darnell. rusty bells go figure but they are absolutely perfect for " the big guy " I mean no reindeer worth his salt would be seen with shiny bells, i mean its just not realistic. Both cards are fabulous Darnell but I adore the moose card, Thank you for joining us for Merry Monday. Hey there, Darnell! Under that heart of gold of yours, lies some rusty jingle bells. They are mooseic to my ears!I can hear them tinkling! Love your watercolour card too! Thanks so much for the kind comment on my nail polish card. You are such a gem! I'm getting overwhelmed with all the goodness on your blog as I catch up from being away! Being a nurse agrees with you, my friend! Hope you've had no more drama with hubby--miss you! Forgot to say, if the moose card doesn't win there's something wrong in the universe! I love that big moose, Darnell, and am so glad he waited around for you to finally use him on a card. I,too, have some of those rusty bells, but then again as my granddaughter says "Gramby likes things old and rusty." Truer words were never spoken. You did a wonderful job on the HLS logo and I'm sure Kylie appreciated seeing it on a cards. Two fabulous cards Darnell! I feel so bad I haven't been visiting lately I haven't been visiting anywhere lately just can't seem to get out of park. However a visit to the Playhouse always makes me smile. Your moose is too cute, love that ribbon. It is moose hunting season in my parts right now (boo), I don't think a hunter would mistake my little Sam for a moose but I keep a pretty close eye on him just the same. THIS CARD IS a PErfect card for an Outdoorsman!!! Wonderfully done and just the perfect accents added!!! Hope your week is a good one!!! OK, so everyone can have their own opinion, I know! Thank goodness this fabulous card is one of the HMs at MM--congrats, Darnell! Hi Darnell, just popping by to catch up with what you've been up to and first of all I must say what a super photo of Hammy and what a handsome little chap he is. Thanks so much for always making me smile when I visit your blog...it's always fun to stop by! 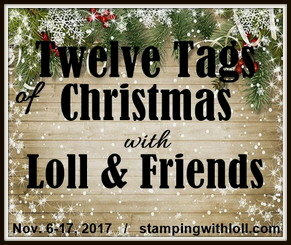 And...Thank you for playing along with us this week at Addicted to Stamps! Your cards are amazing... I love that moose's rusty bells... as you say they're perfect, probably charge more for a bit of rust! Anyways it's perfect for a chap! lovely card. Thanks for joining us at Colour Me!! Two lovely cards, Darnell! Watercolored is so energetic! Thank you for joining us at Colour Me! Two awesome cards Dolly! LOVE the patterned paper behind the moose ... seriously, it's gorgeous. And the rusted bells are the perfect big of bling for a moose. Such fun cards Darnell! We have a softspot for moose around here and I just love the moose card, especially the bells and fun ribbon. Two fabulous cards. I love your moose. The ribbon and bells are just perfect. Love your moose with his rusty nails!! Great job on all of the challenges and so thrilled that you joined us at Colour Me! OH! MY! GOODNESS! Your moose card is INCREDIBLE....'specially' with the rusted bells! Winner, winner, chicken dinner in all four entries for this majestic fella! EVERYTHING on your card WORKS!!! I love, love, love this card! Gorgeous 'dripping' water colored inks on your thank you card! I love the bold yellow bottom panel and the embossed images! Mm, yes finally made it back to say hi... been scrolling down your posts with its lovely nonsense throughout .. we do enjoy it so tell Hammy dear not to stop now! Love the first one here with the mooose on the loose! don'cha love it when you get use items you've been wanting to use for ages.. like the bells and ribbon. ... and well the watercolour card is simply gorgeous. Thanks for popping over, dear friend, and I pray for you both and that hubby dear grows betterer each an every day. Love those 'left in the rain' rusted bells on the moose card and what great ribbon you had to use on it, Darnell!!! The added shadows really look great!!! Your twofer is beautiful - love how you've got the colours only at the top and the EF and the curve is lovely!!! What a marvellous masculine moose! More brilliance from you Darnell and loving that enormous Moose! Perfect guy card and thanks so much for playing along this week! oh I LOVE the moose and the ribbon is so fab - I can see why it has been NBUS for so long! Gotta love those bells too! I want to CASE your watercolour effect, it's so fantastic, thanks for the inspiration. Both cards are stunning! Thank you for sharing at ATSM. How marvelous that all the squealing (I'm nearly doing that here, after reading your post, but using my 'inside voice' because I'm surrounded by a handful plus 3 students writing exams. Don't want to set them off a-squealing...) lead to this marvelous majestic moose, bedecked in his rusty bell! Actually, we brought home 'rusty' bells suspended on coarse wool-woven necklaces, created for yaks to wear in Nepal. I don't think any yaks wore what we bought...thankfully! We've seen a couple moose here over the summer; they're very solitary creatures, so when one makes an appearance, the traffic does come to halt. Fortunately, they show up on a secondary highway...and pose most regally for photos for those who want them. They are big! Your second card: perfect for Kylie in every way! How thoughtful you are to send it to her! I love her stamps and she is such a delight (as are you)!